Entrepreneurs in the US have developed a free iPhone and iPad App to display retail social enterprises that are closest to the user, wherever you are - even in Australia. Entrepreneurs in the US have developed a free iPhone and iPad App to display retail social enterprises that are closest to the user, wherever you are – even in Australia. The Social Impact App includes restaurants, coffee shops, catering services, bakeries, ice cream stores, artisan stores, and more. The plan is to expand the service to include social enterprises such as Thrift Stores (in the US) or Opp Shops in Australia. The npEnterprise online social enterprise forum and Rolfe Larson Associates LLC created the Social Impact App in partnership with Social Enterprise Alliance (US), and the Kibble Education and Care Centre (Scotland). Rolfe Larsen says a social enterprise is a business whose primary purpose is to serve the common good. “That purpose might include training and employing homeless or low-income individuals or by paying a "fair trade" price to artisans from the developing world. 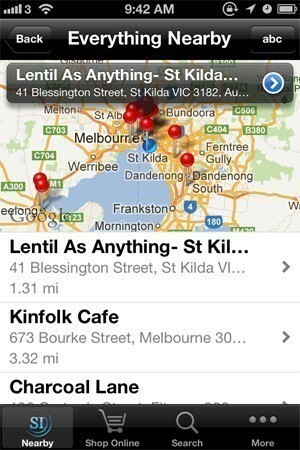 “The Social Impact app already includes a number of Australian social enterprises,” Larsen said. The free App is available for download from iTunes.